The Indigenous Siberian Health and Adaptation Project is an international collaborative research project that focuses on two primary issues related to metabolic adaptation and health change among indigenous Siberians. The first is adaptation to the circumpolar environment, with a focus on evaluating evidence for metabolic adaptation to cold stress. This research tests the hypothesis that human groups native to cold regions have elevated basal metabolic rates (BMRs) as a result of exposure to chronic cold stress. Our findings to date have supported this conclusion (see Snodgrass et al. 2005 in the American Journal of Human Biology and Leonard et al. 2005 in the Annual Review of Anthropology), and we continue to research seasonal variation in metabolic rate and the hormonal mechanisms responsible for this physiological adaptation. Most recently, we published two papers in the American Journal of Human Biology that identified subsistence participation and age as key influences on seasonal variation in metabolism (Leonard et al. 2014) and clarified the role of thyroid hormones in structuring metabolic adaptation (Levy et al. in 2013). We've also documented recent declines in the extent of metabolic upregulation (Snodgrass et al. 2011 [first published in Russian in the local journal Yakut Medical Journal at the request of our collaborators]). The second research goal of the Indigenous Siberian Health and Adaptation Project is to better understand how social and economic changes among native Siberians influence contemporary population health. In particular, we have investigated the myriad factors (e.g., diet, physical activity, chronic psychosocial stress, alcohol, etc.) that contribute to the increased burden of cardiovascular and metabolic disease that has emerged among indigenous Siberians in the past decade. Our research on economic development and health has been extensively published, including on physical activity (Snodgrass et al. 2006; Wilson et al. 2014, in press), cardiovascular risk and inflammation (Sorensen et al. 2006; Snodgrass et al. 2007), metabolic syndrome (Snodgrass et al. 2010), obesity (Snodgrass et al. 2006; Streeter et al., 2016), and thyroid autoimmune disorders (Cepon et al. 2011). In addition, Snodgrass recently contributed an invited review of indigenous circumpolar health to Annual Review of Anthropology that emphasizes the triple burden of disease (i.e., elevated and increasing burden of chronic disease, modestly elevated infectious disease level, and high rates of mental health-related challenges) and unique vulnerability of these peoples to climate change (Snodgrass 2013). This research was also discussed in a recent review on indigenous health in Annual Review of Anthropology by Snodgrass and collaborator Claudia Valeggia from Yale (Valeggia and Snodgrass 2015). A particularly exciting area of the Siberia research has investigated whether metabolic adaptation to cold stress among the Yakut and other indigenous circumpolar groups has consequences for chronic disease risk. This research has led to the conclusion that the distinctive set of health changes experienced by indigenous Siberians in the context of economic development (i.e., extremely high blood pressure levels, moderate obesity, and relatively favorable blood lipids) reflects the combination of: 1) the distinctive social and political history of Native Siberians, and 2) biological adaptation to the circumpolar environment. These findings have been published in several peer-reviewed articles (Snodgrass et al. 2007, 2008; Leonard et al. 2009), presented at numerous professional meetings, described in several public lectures, and discussed in a news feature in Science (326: 1478-1479, 2009). This research is important because it has shifted the perspective on economic development from always leading to one set of health outcomes experienced by all transitioning populations (i.e., obesity, diabetes, high blood pressure, and cardiovascular disease) to a more nuanced picture where different populations have unique sets of health risks that are structured by underlying differences in susceptibility, developmental environments, and sociocultural factors that influence exposure to risk factors. The project also provides feedback on health and well-being to study participants and other community members, and has contributed to public health by providing advice to government officials and doing radio interviews on healthy diets and lifestyles. The Indigenous Siberian Health and Adaptation project is co-directed by Josh Snodgrass (University of Oregon) and Bill Leonard (Northwestern University) and is a continuation of a project initiated by Michael Crawford and Bill Leonard in 1991. 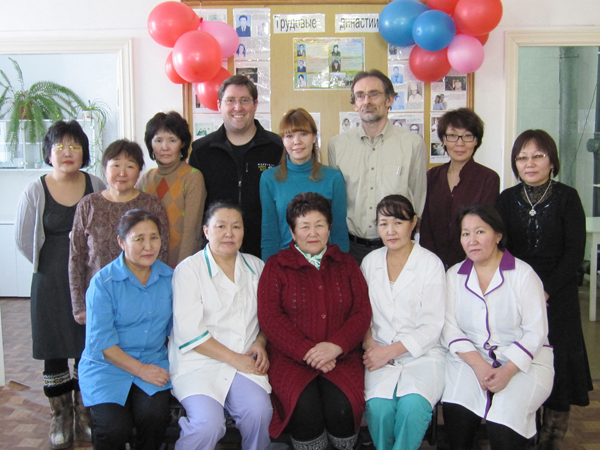 Over the past decade, the project has been a collaborative effort with scientists and physicians from the University of Kansas (Larissa Tarskaia and Michael Crawford), the Yakut Scientific Center (Aitalina Egorova, Natalia Maharova, Irina Pinigina, Simeon Halyev, Niurguyana Matveeva, Anna Romanova, and M.I. Tomsky), and the FSRI Institute of Health/Research Institute of Health, North-Eastern Federal University in Yakutsk, Russia (Tatiana Klimova, V.I. Fedorova, M.E. Baltakhinova, and Vadim G. Krivoshapkin). Furthermore, the project has involved a number of students including those from the University of Oregon (former graduate students Tara Cepon-Robins [now an Assistant Professor at the University of Colorado-Colorado Springs], Melissa Liebert [now a postdoctoral fellow at University of Oregon], Felicia Madimenos [now an Assistant Professor of Anthropology at CUNY-Queens College], Erica Squires, and undergraduate students Tyler Barrett, Katie Schweber, Elizabeth Streeter, and Vimal Balu) and Northwestern University (Stephanie Levy). Northwestern University former postdoctoral fellow Hannah Wilson has also been a key investigator on the project for the last several years. In the past, we have also collaborated with Dale Schoeller (University of Wisconsin, Madison), Mark Zlojutro Kos (Texas Biomedical Research Institute), Thom McDade (Northwestern University), Sharon Williams (Purdue University), and Mark Sorensen (University of North Carolina-Chapel Hill). The project has been made possible through the generous funding of a number of federal granting agencies (National Science Foundation [ARC-0802390] and the Natural Sciences and Engineering Research Council of Canada), private foundations (Wenner-Gren Foundation for Anthropological Research [6884), the Leakey Foundation, Sigma Xi, and the National Geographic Society], universities (University of Oregon, Northwestern University, University of Guelph, and University of Florida), and research institutions (the Yakut Science Center and the FSRI Institute of Health). The project has been recently funded by a grant grant from the Leakey Foundation to Stephanie Levy to support her research on brown fat ("The adaptive significance of brown fat among the Yakut of Siberia"). Northern Russia is an enormous region that stretches across Asia from the Kola Peninsula to Chukotka, with a total population of ∼7.2 million. The indigenous population [i.e., the 40 groups of “Numerically Small Peoples” of northern Russia (e.g., Evenki, Nenet, Ket, Nganasan, Chukchi, and Yup’ik)] is ∼280,000 people. In addition, several other ethnic groups such as the Buryat (∼445,000 people) reside in this region and are considered by most researchers to be indigenous, yet they are not recognized as indigenous by Russia and instead are termed ethnic minorities. The traditional subsistence economy varies among indigenous northern Russians and includes maritime hunting, reindeer hunting, taiga hunting and fishing, reindeer herding, and horse and cattle herding. Indigenous Siberians experienced profound changes in lifeways during the Soviet period and, after the collapse of the Soviet Union in 1991 unleashed catastrophic political and economic changes, these populations again experienced major transformations that forced many to renew their reliance on traditional subsistence activities. The aftereffects of these profound transitions continue to impact native Siberians. overlap or full geographic distribution. From Snodgrass 2013. The Indigenous Siberian Health and Adaptation Project has focused its research on the Yakut (Sakha), a native population concentrated in northeastern Siberia that makes up ∼45% of the population of the Sakha Republic. Members of the Turkic language family, the Yakut traditionally practiced a complex but variable subsistence strategy focused primarily on transhumant horse and cattle pastoralism (see Snodgrass et al. 2005). The Yakut have experienced particularly rapid shifts in lifeways over the past decade as a result of regional economic development (see Snodgrass et al. 2007; Leonard et al. 2009; Sorensen et al. 2009). We have also made extensive comparisons using data collected among other indigenous Siberian populations (i.e., Evenki, Ket, and Buryat) in the earlier phase of the project; for example, see Leonard et al. 2005 on metabolic adaptation and Snodgrass et al. 2006 on trends in body composition. individuals in traditional clothing in front of a newly opened hospital in Berdygestiakh, Russia. The PIs have in the past made data from the project available to other researchers. For example, Andrew Froehle used metabolic data from the Yakut in his analysis of the effects of climatic variation on basal metabolic rate (Froehle AJ. 2008. Climate variables as predictors of basal metabolic rate: New equations. Am J Hum Biol 20: 510-529.). If you are interested in discussing data availability, please contact Josh Snodgrass. The project has led to publications and presentations on a range of topics, including metabolic adaptation, stress and lifestyle change, and changes in chronic disease patterns in the post-Soviet period. Cepon-Robins TJ, Leonard WR, Tarskaia LA, Klimova TM, Fedorova VI, Baltakhinova ME, Krivoshapkin VG, and Snodgrass JJ. 2015. The Indigenous Siberian Health and Adaptation Project: Implications of Epstein-Barr Virus infection for thyroid health and autoimmunity among an indigenous circumpolar population. American Journal of Human Biology 27: 264-265. Snodgrass JJ, Leonard WR, Tarskaia LA, Klimova TM, Fedorova VI, Baltakhinova ME, and Krivoshapkin VG. 2015. Body size and proportions among four indigenous Siberian populations: Climatic and social factors. American Journal of Physical Anthropology (Supplement) 60: 292. Levy SB, Leonard WR, Tarskaia LA, Klimova TM, Fedorova VI, Baltakhinova ME, Krivoshapkin VG, and Snodgrass JJ. An assessment of infrared thermal imaging as an indirect method for quantifying variation in brown adipose tissue using data from the Indigenous Siberian Health and Adaptation Project. American Journal of Human Biology 26: 270. Snodgrass JJ, Leonard WR, Tarskaia LA, Klimova TM, Balu VR, Fedorova VI, Baltakhinova ME, and Krivoshapkin VG. 2014. Secular trends in body size and proportions among indigenous Siberians: The role of developmental and adaptive environments. American Journal of Physical Anthropology (Supplement) 58: 243. White FJ, Snodgrass JJ, and Wakefield ML. 2014. Application of non-parametric tests to compare multiple differing measures of similarity and computed synthetic variables or indices. American Journal of Physical Anthropology (Supplement) 58: 271. Levy SB, Leonard WR, Tarskaia LA, Klimova TM, Fedorova VI, Baltakhinova ME, Krivoshapkin VG, and Snodgrass JJ. 2014. Does head size influence metabolism: A test of the Expensive Tissue Hypothesis using data from the Indigenous Siberian Health and Adaptation Project. American Journal of Physical Anthropology (Supplement) 58: 168-169. Wilson HJ, Leonard WR, Costa S, and Snodgrass JJ. 2014. Cleaning and management of accelerometry data cleaning in free living populations. American Journal of Physical Anthropology (Supplement) 58: 274. Levy SB, Leonard WR, Tarskaia LA, Klimova TM, Fedorova VI, Baltakhinova ME, Krivoshapkin VG, and Snodgrass JJ. 2013. The Indigenous Siberian Health and Adaptation Project: Lifestyle factors and seasonal changes in metabolic health among the Yakut (Sakha) of northeastern Siberia. American Journal of Human Biology 25: 264. Balu VR, Levy SB, Cepon-Robins TJ, Leonard WR, Tarskaia LA, Klimova TM, Fedorova VI, Baltakhinova ME, Krivoshapkin VG, and Snodgrass JJ. 2013. The Indigenous Siberian Health and Adaptation Project: Seasonal variation in autoimmune thyroid disorders among the Yakut (Sakha) of Siberia. American Journal of Human Biology 25: 252. Schweber KE, Liebert MA, Leonard WR, Tarskaia LA, Klimova TM, Fedorova VI, Baltakhinova ME, Krivoshapkin VG, and Snodgrass JJ. 2013. The Indigenous Siberian Health and Adaptation Project: Chronic stress and its relation to lifestyle change, Epstein-Barr virus, blood pressure, and C-reactive protein among the Yakut (Sakha) of Siberia. American Journal of Human Biology 25: 273-274. Snodgrass JJ, Leonard WR, Tarskaia LA, Klimova TM, Fedorova VI, Baltakhinova ME, Levy SB, and Krivoshapkin VG. 2013. The Indigenous Siberian Health and Adaptation Project: Seasonal variation in metabolic rate among indigenous Siberians. American Journal of Human Biology 25: 276. Streeter EA, Squires EC, Leonard WR, Tarskaia LA, Klimova TM, Fedorova VI, Baltakhinova ME, Krivoshapkin VG, and Snodgrass JJ. The Indigenous Siberian Health and Adaptation Project: Tissue hypoxia, adiponectin dysregulation, and hemoglobin levels among the Yakut (Sakha) of Siberia. American Journal of Human Biology 25: 276-277. Wilson HJ, Leonard WR, Cepon-Robins TJ, Tarskaia LA, Klimova TM, Fedorova VI, Baltakhinova ME, Krivoshapkin VG, and Snodgrass JJ. 2013. The Indigenous Siberian Health and Adaptation Project: Physical activity and markers of cardiovascular health in the Yakut (Sakha). American Journal of Human Biology 25: 281-282. Snodgrass JJ and Leonard WR. 2013. Health research in biological anthropology: Integrating evolutionary and biocultural approaches. American Journal of Physical Anthropology (Supplement) 56: 258. Streeter EA, Squires EC, Leonard WR, Tarskaia LA, Klimova TM, Fedorova VI, Baltakhinova ME, Krivoshapkin VG, and Snodgrass JJ. 2012. The Indigenous Siberian Health and Adaptation Project: Adiponectin, body composition, and cardiovascular health among the Yakut (Sakha) of Siberia. American Journal of Human Biology 24: 243-244. Levy SB, Leonard WR, Tarskaia LA, Klimova TM, Fedorova VI, Baltakhinova ME, Krivoshapkin VG, and Snodgrass JJ. 2012. The Indigenous Siberian Health and Adaptation Project: Seasonality in thyroid function and metabolic health among the Yakut (Sakha) of eastern Siberia. American Journal of Human Biology 24: 231. Snodgrass JJ, Leonard WR, Tarskaia LA, Klimova TM, Fedorova VI, Baltakhinova ME, and Krivoshapkin VG. 2012. The Indigenous Siberian Health and Adaptation Project: Evidence for a recent change in basal metabolic rate among the Yakut (Sakha) of Siberia. American Journal of Human Biology 24: 242-243. Squires EC, Streeter EA, Leonard WR, Tarskaia LA, Klimova TM, Fedorova VI, Baltakhinova ME, Krivoshapkin VG, and Snodgrass JJ. 2012. The Indigenous Siberian Health and Adaptation Project: Relationships between C-reactive protein, interleukin-6, adiponectin and cardiovascular disease and the metabolic syndrome. American Journal of Human Biology 24: 243. Cepon TJ, Liebert MA, Madimenos FC, Sugiyama LS, Snodgrass JJ, Blackwell AD, Leonard WR, Tarskaia LA, Klimova TM, and Krivoshapkin VG. 2011. Variation in cardiovascular disease risk in response to market integration in two diverse populations. American Journal of Physical Anthropology (Supplement) 52: 107. Cepon TJ, Snodgrass JJ, Leonard WR, Tarskaia LA, Klimova TM, and Krivoshapkin VG. 2011. Physical activity levels and chronic disease risk in the Yakut (Sakha) of Siberia. American Journal of Human Biology 23: 255. Zlojutro M, Tarskaia LA, Sorensen M, Snodgrass JJ, Leonard WR, and Crawford MH. 2010. Coalescent modeling of Yakut origins points to small founding population based on mtDNA variation. American Journal of Physical Anthropology (Supplement) 50: 251. Cepon TJ, Snodgrass JJ, Leonard WR, Tarskaia LA, Klimova TM, and Krivoshapkin VG. 2010. Evidence of autoimmune thyroid disorders among the Yakut of Siberia. American Journal of Human Biology 22: 250-251. Snodgrass JJ, Leonard WR, Tarskaia LA, Cepon TJ, Klimova TM, and Krivoshapkin VG. 2010. Rapid changes in cardiovascular risk factors associated with economic development and lifestyle change in an indigenous circumpolar population. American Journal of Physical Anthropology (Supplement) 50: 220. Williams SR, Snodgrass JJ, Leonard WR, Tarskaia LA, Maharova NV, Egorova AG, Matveeva NP, Pingina IA, Halyev SD, and Romanova AN. 2009. Grip strength and hemoglobin levels among the Yakut of Siberia. American Journal of Human Biology 21: 274. Cepon TJ, Snodgrass JJ, Leonard WR, Tarskaia LA, Maharova NV, Egorova AG, Matveeva NP, Pingina IA, Halyev SD, and Romanova AN. 2009. Anthropometric and lifestyle correlates of blood pressure among indigenous Siberians. American Journal of Human Biology 21: 249. Snodgrass JJ, Tarskaia LA, Maharova NV, Egorova AG, Matveeva NP, Pinigina IA, Halyev SD, Romanova AN, and Leonard WR. 2008. Anthropometric and lifestyle variables associated with the metabolic syndrome among indigenous Siberians. American Journal of Human Biology 20: 233. Leonard WR, Snodgrass JJ, and Sorensen MV. 2007. Physical activity and subsistence energy expenditure in circumpolar populations. American Journal of Human Biology 19: 292-293. Sorensen MV, Leonard WR, and Snodgrass JJ. 2006. High sensitivity C-reactive protein and cardiovascular risk in the Yakut. American Journal of Human Biology 18: 274-275. Snodgrass JJ, Sorensen MV, and Leonard WR. 2006. Adaptive dimensions of health research among indigenous Siberians. American Journal of Human Biology 18: 286. Leonard WR, Snodgrass JJ, and Sorensen MV. 2006. Metabolic variation and adaptation to cold stress among indigenous circumpolar populations. American Journal of Physical Anthropology (Supplement) 42: 121. Snodgrass JJ, Leonard WR, Tarskaia LA, Sorensen MV, Alekseev VP, and Krivoshapkin VG. 2005. Health and economic modernization in the Yakut (Sakha) of Siberia. American Journal of Human Biology 17: 256. Snodgrass JJ, Leonard WR, Tarskaia LA, Alekseev VP, Krivoshapkin VG, and Schoeller DA. 2005. Total energy expenditure in the Yakut (Sakha) of Siberia as determined by the doubly labeled water technique. American Journal of Physical Anthropology (Supplement) 40: 194. Leonard WR, Snodgrass JJ, Sorensen MV, Tarskaia LA, Alekseev VP, and Krivoshapkin VG. 2005. Health consequences of economic and lifestyle change among indigenous Siberian populations: The emergence of the Metabolic Syndrome. American Journal of Physical Anthropology (Supplement) 40: 137. Snodgrass JJ, Leonard WR, Tarskaia LA, Alekseev VP, and Krivoshapkin VG. 2004. Basal metabolic rate in the Yakut of Siberia. American Journal of Human Biology 16: 225. Snodgrass JJ, Leonard WR, Tarskaia LA, Sorensen MV, Mosher MJ, Alekseev VP, and Krivoshapkin VG. 2004. Metabolic adaptation in circumpolar populations: Evidence from indigenous Siberians. Journal of Physiological Anthropology and Applied Human Science 23(6): 370. Zlojutro M, Sorensen MV, Snodgrass JJ, Tarskaia LA, and Crawford MH. 2004. Mitochondrial DNA variation in Yakutia: The genetic structure of an expanding population. American Journal of Human Biology 16: 230-231. Zlojutro M, Sorensen M, Snodgrass JJ, Tarskaia LA, and Crawford MH. 2003. Mitochondrial DNA analysis in Yakutia: Implications for the genetic history of northern Siberia. American Journal of Human Biology 15: 291. Leonard WR, Levy SB, Wilson HJ, Snodgrass JJ, Tarskaia LA, Klimova TM, Fedorova VI, Baltakhinova ME. 2016. Influence of acculturation and lifestyle change on metabolic health among the Yakut of Northeastern Siberia. Paper submitted for presentation at the annual meeting of the American Association of Physical Anthropologists, Atlanta, GA.
Snodgrass JJ. 2015. To Siberia and Beyond: Studying Human Biology and Health at the Edge of the World. Invited lecture, Department of Anthropology, University of Michigan. Snodgrass JJ. 2012-2015. To Siberia and beyond: Studying human biology and health at the edge of the world. Guest lectures in Society of College Scholars Science Colloquium, University of Oregon (undergraduate course: Freshman Honors Science) (6 guest lectures). Barrett TM, Liebert MA, Leonard WR, Tarskaia LA, Klimova TM, Fedorova VI, Baltakhinova ME, Krivoshapkin VG, and Snodgrass JJ. 2015. Associations among television viewing, lifestyle, and cardiovascular health in an indigenous Siberian population. Paper presented at the Undergraduate Research Symposium at the annual meeting of the American Association of Physical Anthropologists, St. Louis, MO. Snodgrass JJ. 2015. Evolutionary insights into cardiovascular and metabolic health among indigenous Siberians. Paper presented at the Western Regional International Health Conference, Eugene, OR. Snodgrass JJ. 2015. To Siberia and beyond: Studying human biology and health at the edge of the world. Academic interest session, Scholars Recognition Day lecture for prospective students and their parents, University of Oregon. Snodgrass JJ. 2014. Health of indigenous circumpolar populations. Paper presented at the workshop on Indigenous Well-Being amid Socioeconomic Transformation at the Broom Center for Demography, University of California, Santa Barbara. Snodgrass JJ. 2014. To Siberia and beyond: Studying human biology and health at the edge of the world. Duck Preview lecture for prospective students and parents, University of Oregon (4 lectures). Snodgrass JJ. 2008-2014. Human adaptation to cold environments. Guest lectures in the Department of Human Physiology, University of Oregon (undergraduate/graduate course: Environmental Physiology [HPHY 470/570]) (7 guest lectures). Snodgrass JJ and Leonard WR. 2013. Effects of social and environmental change on the biology and health of contemporary human populations: A view from Siberia. Invited paper presented at the annual meeting of the Society for American Archaeology, Honolulu, HI. Snodgrass JJ. 2013. To Siberia and beyond: Studying human biology and health at the edge of the world. Faculty Perspectives lecture for parents of incoming students, University of Oregon. Snodgrass JJ, Liebert MA, Leonard WR, Tarskaia LA, Klimova TM, Fedorova VI, Baltakhinova ME, and Krivoshapkin VG. 2012. Cardiovascular and metabolic health among an indigenous circumpolar population from Siberia: The effects of economic development and lifestyle change. Poster presented at the Population Association of America meeting, San Francisco, CA. Snodgrass JJ. 2012. To Siberia and beyond: Studying human biology and health at the edge of the world. Public lecture in the How Did We Get Here? Series, Sunriver Nature Center, Sunriver, OR. Snodgrass JJ. 2012. Biomarkers of stress and physiology in global health research. Public lecture sponsored by the Students for Global Health, University of Oregon. Snodgrass JJ. 2011. To Siberia and beyond: Studying human biology and health at the edge of the world. Invited plenary session paper given at the annual Northwest regional meeting of the American College of Sports Medicine, Eugene, OR. Snodgrass JJ. 2011. Stress biomarkers and their role in health research. Invited talk at the Sacred Heart Medical Center/PeaceHealth Awards Ceremony, Eugene, OR. Snodgrass JJ. 2011. Out in the cold: Native Siberian health in the post-Soviet period. Invited talk at the National Science Foundation, Washington, DC. Cepon TJ, Snodgrass JJ, and Leonard WR. 2010. The Emergence of hypertension as an Indicator of changing lifestyles and psychosocial stress in indigenous Siberians. Poster presented at the Human Behavior and Evolution Society Conference, Eugene, OR. Cepon TJ, Snodgrass JJ, Leonard WR, Tarskaia LA, Klimova TM, and Krivoshapkin VG. 2010. Autoimmune thyroid disorders as a consequence of cold adaptation among the Yakut of Siberia. Paper presented at the annual meeting of the American Association for the Advancement of Science Pacific Division, Ashland, OR. Snodgrass JJ, Leonard WR, Tarskaia LA, Cepon TJ, Klimova TM, and Krivoshapkin VG. 2010. The effects of economic development and lifestyle change on cardiovascular health among an indigenous circumpolar population. Paper presented at the annual meeting of the American Association for the Advancement of Science Pacific Division, Ashland, OR. Snodgrass JJ. 2010. Adaptive dimensions of health research among indigenous Siberians. Invited public lecture at Willamette University sponsored by the Departments of Biology and Sociology. Snodgrass J.J. and Cepon TJ. 2010. Metabolic adaptation and health change among indigenous Siberians. Poster presented at the International Poster Session, International Affairs Office, University of Oregon. Cepon TJ, Snodgrass JJ, Leonard WR, Tarskaia LA, Maharova NV, Egorova AG, Matveeva NP, Pingina IA, Halyev SD, and Romanova AN. 2009. Evolutionary medicine and hypertension among indigenous Siberians. Paper presented at the Northwest Anthropological Conference, Newport, OR. Snodgrass JJ. 2008. Human adaptation to cold environments. Paper presented at the New York Academy of Sciences conference Hypothermia: From Threat to Cure, New York, NY. Snodgrass JJ. 2007. An evolutionary perspective on recent health changes among indigenous Siberians. Institute of Cognitive and Decision Sciences seminar series, University of Oregon. Snodgrass JJ. 2007. Adaptive dimensions of health research among indigenous Siberians. Department of Human Physiology Seminar Series, University of Oregon. Snodgrass JJ. 2007. An evolutionary perspective on recent health changes among indigenous Siberians. Guest lecture in Society of College Scholars Science Colloquium, University of Oregon (undergraduate course: Freshman Honors Science). Snodgrass JJ. 2006. Adaptation and chronic disease in northern populations. Paper presented at the 105th meeting of the American Anthropological Association, San Jose, CA. Snodgrass JJ. 2006. Out in the cold: Native Siberian health in the post-Soviet period. Arctic Vignettes: Research from the Far North lecture series, Museum of Natural and Cultural History, University of Oregon. Snodgrass JJ. 2006. An evolutionary perspective on recent health changes among indigenous Siberians. Center for Ecology and Evolutionary Biology annual retreat, University of Oregon. Snodgrass JJ. 2005. Energetics, health, and economic development in the Yakut of Siberia: A biocultural perspective on lifestyle change in a circumpolar population. Department of Anthropology, UC Santa Cruz. Sorensen MV, McDade TW, Snodgrass JJ, Tarskaia LA, and Shadrina OV. 2002. Stress induced immunosuppression and self-rated health in an indigenous Siberian population. Paper presented at 9th annual International Society for Quality of Life Research, Orlando, FL. Barrett T. 2015. Television viewing, lifestyle, and cardiovascular health among the Yakut (Sakha) of northeastern Siberia. Honors undergraduate thesis for the School of Journalism and Communication, University of Oregon; BS awarded June 2015. Schweber K. 2013. Health Effects of Social Change among the Indigenous Yakut (Sakha) of Siberia: The Influence of Chronic Psychosocial Stress on Epstein-Barr Virus Antibodies, C-Reactive Protein, and Blood Pressure. Undergraduate honors thesis, Robert D. Clark Honors College, University of Oregon; B.S. awarded June 2013. Cepon T. 2009. Anthropometric and Lifestyle Correlates of Blood Pressure among the Yakut (Sakha) of Siberia. Master's thesis, University of Oregon; M.S. awarded June 2009. Liz Streeter (graduated June 2013): Liz presented the results of her research at two national conferences--the 2012 and 2013 annual meetings of the Human Biology Association (in Portland and Knoxville, respectively). The papers were: 1) "The Indigenous Siberian Health and Adaptation Project: Adiponectin, body composition, and cardiovascular health among the Yakut (Sakha) of Siberia" (2012, with coauthors Erica Squires, Bill Leonard, Larissa Tarskaia, Tatiana Klimova, Valentina Fedorova, Marina Baltakhinova, Vadim Krivoshapkin, and Josh Snodgrass) and 2) "The Indigenous Siberian Health and Adaptation Project: Tissue hypoxia, adiponectin dysregulation, and hemoglobin levels among the Yakut (Sakha) of Siberia" (2013, with coauthors Erica Squires, Bill Leonard, Larissa Tarskaia, Tatiana Klimova, Valentina Fedorova, Marina Baltakhinova, Vadim Krivoshapkin, and Josh Snodgrass). The second presentation led to a manuscript, which was recently published in the American Journal of Human Biology. Vimal Balu (graduated Summer 2014): Vimal presented "The Indigenous Siberian Health and Adaptation Project: Seasonal variation in autoimmune thyroid disorders among the Yakut (Sakha) of Siberia" at the 2013 annual meeting of the Human Biology Association in Knoxville, TN (with coauthors Tara Cepon, Stephanie Levy, Bill Leonard, Larissa Tarskaia, Tatiana Klimova, Valentina Fedorova, Marina Baltakhinova, Vadim Krivoshapkin, and Josh Snodgrass). He is currently working to prepare a manuscript on the topic for submission to the American Journal of Human Biology. Comments or questions? Contact Josh Snodgrass.